They will be hitting up North again after their terrific highlight performance at last years Liverpool Pysch Fest which received amazing reviews and feedback from attendees. Mark the 16th of May in your diary as One Unique Signal are back in town to deliver an explosive evening filled with Fuzzed-out guitars, Mesmerizing Loops and harmful walls of sound not for the faint hearted sensitive-eared people (DISCLAIMER!). Loop, The Heads, Sonic Youth, My Bloody Valentine, Can´s repetitive structures or The Telescopes are amongst their influences. Do yourself a favor and take the chance to witness this Animal band Live!One Unique Signal has been feeding the underground Pysch Music scene for over the last 10-15 years in here in the UK. Regardless of limited exposure in the medias they have achieved a prolific back catalogue over the years. With their obvious passion and dedication they have hit many of the roads here in the UK and Europe touring relentlessly, these guys love a live show blowing minds away everywhere they go!!! Be ready to expect Wilderness and Massive doses of Pyschotropic Poison! 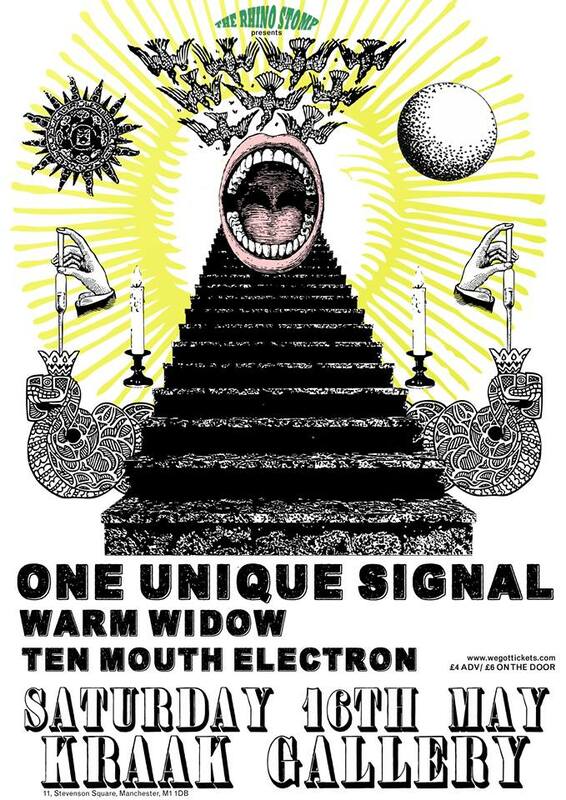 Ten Mouth Electron: We are glad to get Ten Mouth Electron on to the Bill. The Project is formed out of members of other recent appraised Local DIY-lofi underground bands (Salford Media City, Locean, and ILL…… YEAH WE KNOW!) Pysch-Pop, angular post-punk and soaring psychgaze have earned comparisons to PiL, Hawkwind, Talking Heads or The Fall. We can´t recommend enough you get down early for this!